We are a little low on numbers today, but this actually works in our favour initially the group was going to split in two and each half would have worked on a separate project, instead we work as one and everyone gets more time with the tutor to ask questions and get help. We start the day with a quick recap of yesterdays work and then get knee-deep in technique. 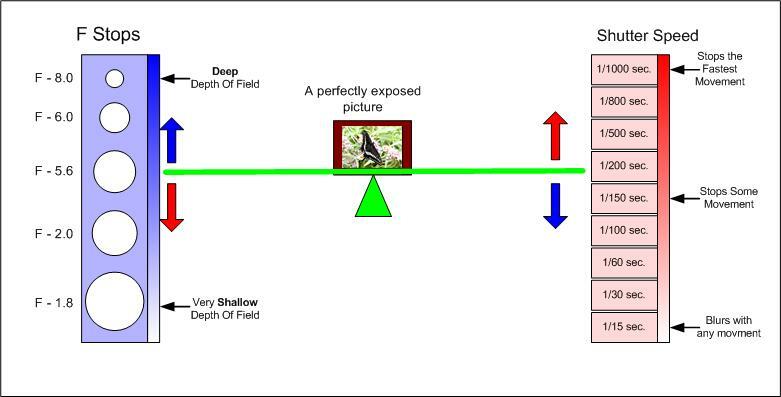 Mark helps the group get to grips with Aperture and Shutter Speed with that aid of this little gem of a diagram. Once we break down the jargon and get cameras in our hands everything starts to make much more sense and we set about catching moving objects, playing with depth of field and seeing how we can use focus to get many different effects. Check out the gallery. These techniques are extremely difficult to get right and it is quite clear that it’s frustrating a couple of people who can’t quite get the shots they want but with perseverance and a little bit of help from the other group members everyone starts to get the hang of things. What is really great to see is the group are not just learning from Mark but from each other, everyone is willing to give someone a hand or run them through the techniques. Great team work makes for a great project, well done guys. 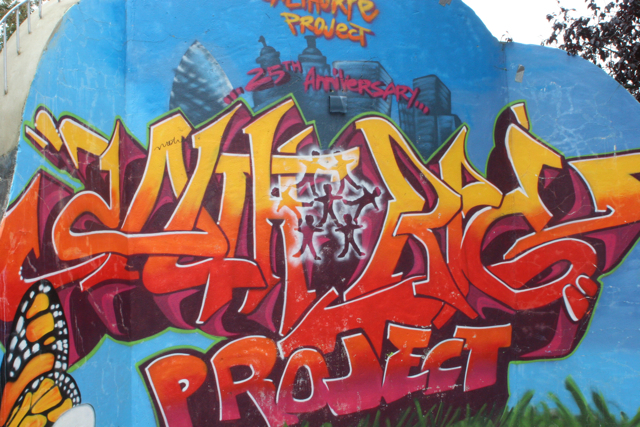 We take a trip down to a local community garden, The Calthorpe Project, where they run session in the summer holidays for young people and adults alike. They kindly agreed to let us take some shots of some of their users, as it’s the summer holidays its always difficult to predict just how many people would be at the centre but we figured its worth a shot. It’s a grey miserable day and so numbers are a little on the low side at the project as well. However, they do have a lovely mother and baby group who are kind enough to let us take some shots of the little ones walking, talking, crawling and getting covered in paint. Here are a set of pictures that the group selected as their favourites. A massive, massive thank you to Nicky and Teresa for letting us come down and use the centre its great to see the community spirit and organisations helping each other out is alive and well. And a massive ‘thank you’ to all those beautiful babies and toddlers and their wonderful mothers and carers for providing such lovely models, pictures are on their way to you. As a professional photographer Mark is very quick to point out that not all Photoshop/airbrushing has to be seen as negative. If you want to lighten a picture or reduce the exposure these are great tools to do that, just like if you want to add a graphic or heighten special effects. The software that performs these tasks is often seen as the bad guy but it goes beyond that, it’s the people who use the tools and distort our ideas of reality that are at fault. This is a perfect example of what we are talking about. 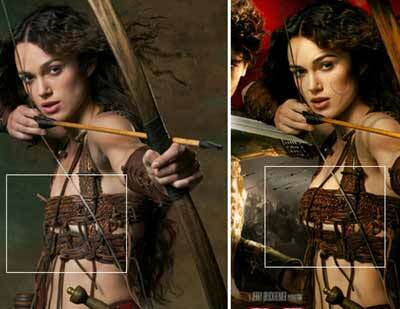 One the left is the UK poster for 2004’s King Arthur, on the right is the US poster. As you can see there are some massive differences. Firstly the colour is much brighter and pops more in the US poster, it’s more dramatic and eye-catching. Which isn’t such a bad thing! However, the enhancement of her chest from an A to C cup is completely unnecessary which has made this example one of the leading images in the battle against airbrushing. Mark focuses the group back on track and we have a little experiment with Photoshop techniques that can reduce exposure, add a little light to dark shots, change the colour to black and white and adding a couple of effects. There is an unsaid agreement that these are the only tools we will use and that any other touch ups are out. that young people have about their body image so we set about finding key questions we can ask to other young people to reflect these key areas. These are the questions generated by the group. Can you show me how you feel about your body? What is your favourite pat of your body and why? What is the bit of your body you like the least and why? If you would change one part of your body what would you change and why? They also agree that they need to take a head shot and a long body shot of each person they interview. With questions set the group now move on to their first interviews and shoot of people related directly to the main subject matter of the project. 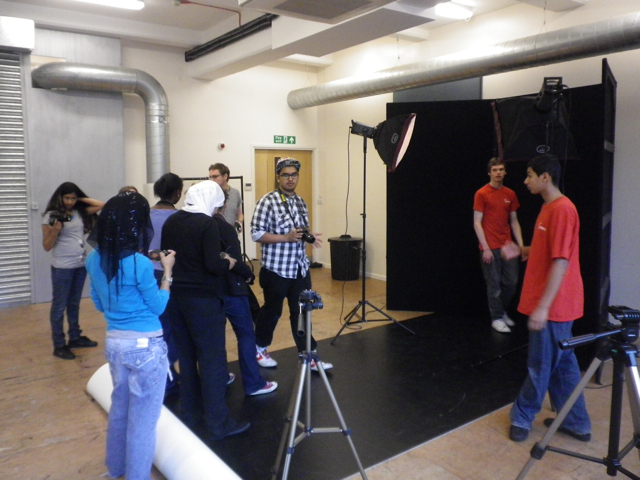 Using all the skills they have gained over the last few days to create interesting and dynamic pictures. With very little time on our hand to find models we pounce on the One KX staff team to help us out, all of which said NO!! – You know who you are!! Luckily for us the Youth Provision Volunteers in the building have no worries in giving us a helping hand. That doesn’t mean they are any less nervous about having their pictures taken so we put them at ease very quickly and begin shooting. Here are some of the shots we took during this session. Being completely honest the afternoon is a little rushed and running around trying to grab models didn’t help the situation, it all feels a little less thought out that some of the other tasks. This is a reflected a little in the work produced, a calm learning environment really does make a different. Every day is a school day and today we learnt loads both students and facilitators. I have made sure that we will get that calm environment back to help learning and make sure we all slow down a little and get things just right. This entry was posted in Aperture, Final Exhibition, Mark Sherratt, Photographic Techniques, Project Journal, Shutter Speed and tagged Calthorpe Street. Bookmark the permalink.